Today, I decided to take a more focused direction in my personal study of Austrian economics. I want to come up with a basic understanding of monetary and economic theories. I made a list of my priority readings. I came up with seven books. Let me start with Pillars of Prosperity. Part 1 talks about The Economics of a Free Society. I will begin with the first speech of the libertarian Congressman. The economics of free society is suffering due to erroneous political ideas. This is the central message delivered by Congressman Ron Paul in September 20, 1984 at the U.S. House of Representatives. Reading Ron Paul’s speech makes me wonder about two things – the widespread ignorance of the American public about the message of Ron Paul and the tenacity of the Congressman for the past 28 years. The Republican Congressman rightly diagnosed that the prevailing contradictions both in the economic and political affairs of the United States springs from a faulty political philosophy that will sooner or later result into political and economic crisis. Ron Paul was right all throughout this time. He has already foreseen the 2008 crisis 24 years in advance though he did not know the precise date of the crisis. For Dr. Ron Paul, the primary problem of the United States is the expanding power of the government through regulations, taxes, overspending, welfarism, invasion of privacy, military spending, and international adventurism. He saw this expanding power of government as the ultimate threat to individual freedom. The fiscal crisis is secondary; it is the threat to liberty that must be taken seriously. Dr. Paul describes this big government as the “cancer” in the land. The problem in finding a remedy to this cancer is solved through bigger government. This kind of remedy will make the cancer more dangerous and deadly. “…a day that the world financiers will rush from dollars just as they have recently rushed into dollars, causing even worse chaos in the international financial markets” (p. 5). One immediate consequence in the breakdown of the value of US dollar is failure in international trade. This has been proven repeatedly throughout history once a nation debased its own currency. War is another result related to economic crisis. War benefits only the powers that be. Both economic depression and war are unnecessary outcomes of foolish decisions of politicians. After describing the certain destination of a faulty idea of government, Dr. Paul claims that the only way to avert the crisis is to adopt a new attitude about the role of the government. Limited government is the solution. The government must keep away from the operation of the free market. The US government must stop intervening in the affairs of other nations. The path to change is not easy. The public must be made aware about the existence and the influence of the shapers of public opinion. Seeing from this context, politicians are mere puppets. Ideas are the primary weapons of libertarians to win this battle for limited government. Restoration of political and economic order is the immediate effect for having a limited government. Congressman Paul offers six concrete proposals to cut the deficit. Among them are cutting budgets both for welfare and warfare, returning to sound money, and abolishing bank cartel. These are the tangible steps to bring freedom back to the people. The problem is big government and the restoration of freedom is the solution. Creator of heaven and earth, my Redeemer, I am praying dear Lord that you bless my study of Austrian economics. Equip me with a basic understanding of monetary and economic theories for my writing and teaching. Bless my study of Pillars of Prosperity. I do pray dear Lord that this kind of knowledge will spread all over the world so that governments and central banks will stop destroying the economy by continuous creation of fiat money. 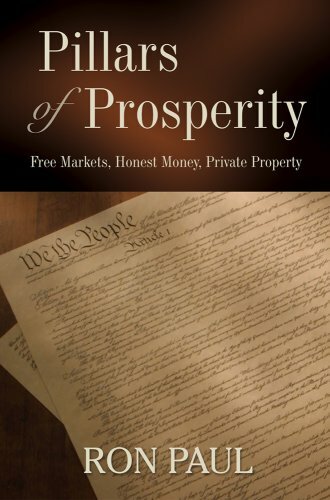 Raise lawmakers and politicians all over the world who uphold personal liberty, just laws, and free market activity not only in their talk, but also in their determination to introduce reforms. Enlighten the public so that governments will be made accountable for all their actions. We admit Lord that we are but humans, your creatures. We are worried about the future of humanity. We do not know the future, but we know that you hold the future. Though the times are uncertain, we know that we can still trust you. Forgive us for not believing in you. Forgive our generation for our pride that in our intellectual sophistication we boast that belief in your existence is a mark of ignorance. Forgive our governments for ascribing divinity unto themselves. Though they may deny it in words, but their actions tell otherwise. We have been witnessing for decades this messianic nature of the government. There are more regulations today than ever; governments are exacting excessive taxes from their citizens more than what you require; poor people are looking for the government to take care of them and evade their personal responsibilities; invasion of privacy and militarism are now becoming widespread. Change the minds of those in power. Enlighten us to see that no matter whoever sits in the positions of power, nothing will change, the crisis remains, and getting worse. Forgive us for debasing our currencies (Isaiah 1:22) and for not accepting that it is a violation of your law. Enlighten our politicians. Give them knowledge and courage to fulfill their oaths when they took their public office. Help us to see that the government is not the answer to present crisis. Change our attitude towards the government. Help us obey the government as she faithfully fulfills her ministry of justice. Abolish bank cartels and help us return to you and return to honest money.